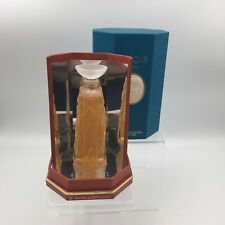 BEAUTIFUL Limited Edition 1993 LALIQUE France 'CHEVREFEUILLE' PARFUM COLLECTION BOTTLE in original presentation box with matching LALIQUE crystal pendant incorporated into the design of the box. Signed'Lalique France' and numbered'J.0035' in etching, on the bottom, as pictured. The Baccarat logo is on. It has a red and white double overlay and interior concentric Millefiori group canes. the back but is very faint. 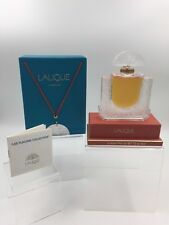 BEAUTIFUL Limited Edition 1994 LALIQUE France 'FOUR MUSES' PARFUM COLLECTION BOTTLE in original presentation box. Signed 'Lalique France'. Signed in etching, on the bottom, as pictured. 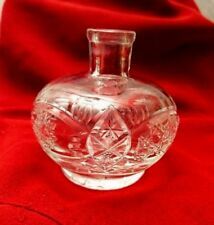 This mouth blown frosted and clear crystal parfum bottle is full and sealed with parfum contents. It is in perfect, mint condition. Lalique's designs portraits an elegant simplicity. This piece is painstakingly hand-crafted in France. Originally dating from the 1930s, this model is still produced by Lalique. 3 1/2" tall with a 3 3/4" wide.